Today sees the start of the Hyper Japan 2017 festival at Tobacco Dock in London, a celebration of all things Japanese, which runs until Sunday. Electronic giant Nintendo is on site promoting a number of its new game releases, and players will get a chance to play the new ‘Super Mario Odyssey’, with multiplayer battles on stage no doubt proving to be popular. Tomorrow will also be a celebration of the upcoming release of Splatoon2 on Saturday 21st, with a variety of different activities taking place around the historic Tobacco Dock venue. As you can see from these images (thanks to our National Operations Manager on site, Lee Vipond) the Event Hire UK team have been busy over the past 48 hours ensuring that all the furniture hire and catering equipment hire products are in situ for both the organisers and their exhibitors. Everything from tensabarrier hire, bottle fridge hire, cold room hire, folding chairs, staging hire, griddle hire, sink units, trestle tables and many more product lines are on location, with the team having provided not only the supply of the event equipment but also the set-up, enabling the organisers to concentrate on other areas of their event, safe in the knowledge that their furniture hire and catering equipment hire requirements are in safe hands. 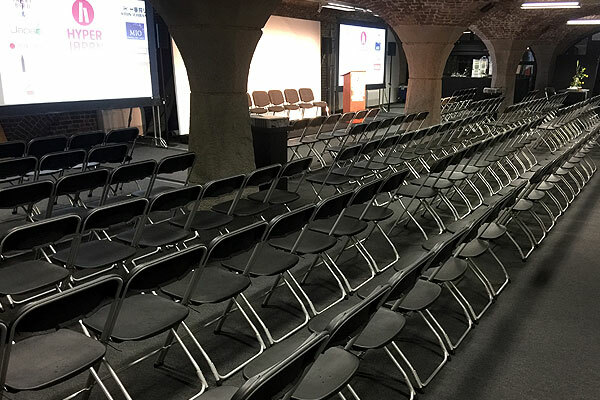 If you are an event organiser who needs to hire furniture, catering equipment and more for your event, don’t hesitate to contact Event Hire UK. We have the range, the quantity, the quality, the service and the prices to help bring in your event on budget. Contact a member of our expert sales team who will be delighted to discuss your upcoming event requirements in more detail.